The 90-Degree PosiTemp Valve Trim Kit from MOEN features right-angled design elements and crisply honed edges to put the finishing touch on your modern bathroom buildout. Part of the M-PACT common valve system, this set makes it simple to substitute the trim without tweaking the plumbing should your future style preference change. A single lever on the faucet rotates 270 degrees to dial in your preferred heat intensity, held steady by a compatible PosiTemp pressure-balancing control valve. The mirror-like chrome finish offers high reflectivity for a sparkling look that coordinates with any design scheme for versatile use. This kit requires MOEN valve 2510, 2520, 2570, 2580 or 2590 (sold separately) to complete installation. Create a relaxed, yet traditional, style statement in the bath with Wynford faucets and accessories. Multiple faucet designs and finish choices give you a variety of decorating options to truly enhance and personalize your space. Oil rubbed bronze finish incorporates the warmth of bronze with tumbled light and dark accents, creating an antiqued look. Elegant, traditional design details and distinctive finishing touches present a sense of uncommon luxury in the Weymouth collection. Distinctive accents include porcelain inlays that feature Euro influenced decorative script and signature styling elements. This oil rubbed bronze exacttemp<sup></sup> tub/shower valve only was built to last by Moen. Designed for use in your bath. 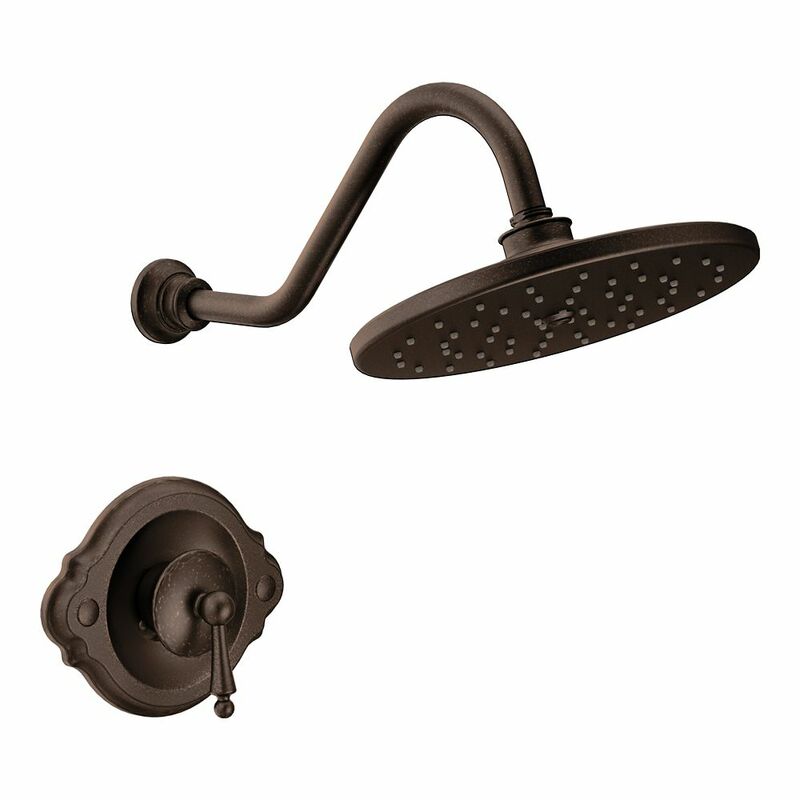 Waterhill Posi-Temp Showering Trim in Oil-Rubbed Bronze (Valve Sold Separately) is rated 3.5 out of 5 by 2. Rated 2 out of 5 by KOTSA from Over Priced All plastic. For the price I paid I expected better materials but these are all plastic except the pipe to the shower head.